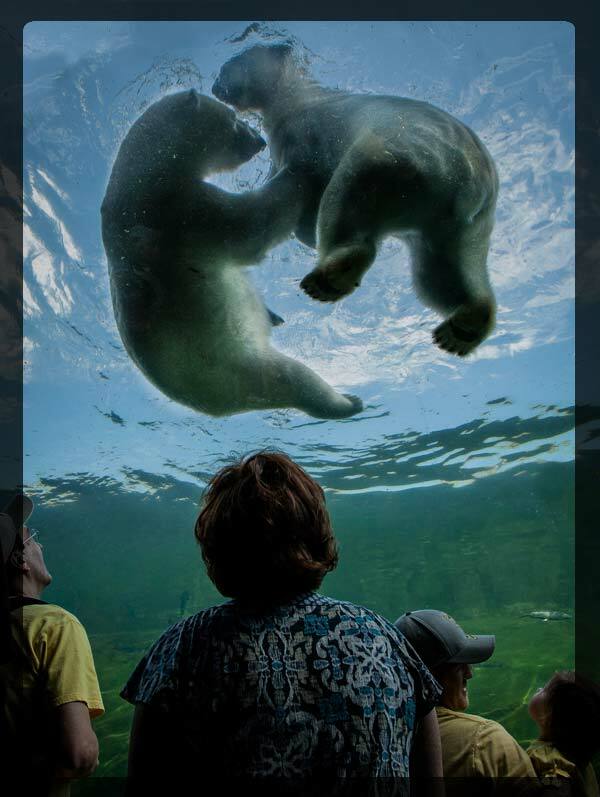 The Columbus Zoo and Aquarium is acclaimed nationally and internationally as a year-round recreational and educational facility as well as a conservation center contributing to the preservation of the world's wildlife and habitats. For anyone that has been to Disney's Animal Kingdom in Orlando, you'll have a feel for what the Columbus Zoo and Aquarium is becoming. 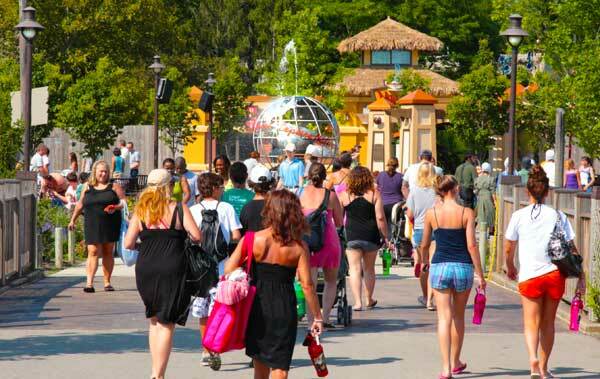 The designers and engineers of the Columbus Zoo have begun a multi-phase transformation of the park into a combination of amusement rides, safari exploration, wild-life and excitement where visitors can experience Mother Nature up close without bars getting in the way. While much of the park still has many of the trappings of the old zoo, it is definitely embracing the magical animal kingdom. The Columbus Zoo and Aquarium currently is home to more than 10,000 animals, including almost 600 species from around the world and Jack Hanna, animal superstar. 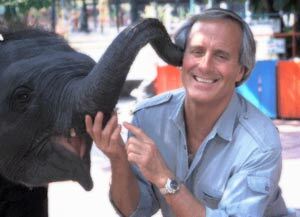 It was under Jack Hanna's guidance that the zoo moved forward from almost being non-existence to one of the worlds best zoo destinations with more than 2 million visitors each year. In 2012, the zoo opened Stingray Bay, a new attraction located in Jungle Jack's Landing. For an additional fee (WHY?) visitors can interact with the infamous stingrays. These sea creatures have had their deadly barbs removed for safety reasons. Also n 2012 plans for a new 43 acre African Safari exhibit were approved and expected to open in mid 2014. This exciting new exhibit not only gives the animals even more room, but it also offers visitors a more intimate view of the African wildlife. The new exhibit will include lions, rhinos, giraffe, zebras, ostrich, monkeys, cheetahs, meerkats and other hoofed animals. Originally the zoo was housed at Franklin Park. It was founded in 1927 with a small menagerie of donated animals. Later it moved to its present location near the O'Shaughnessy Dam. Over the next four decades the city and community worked together to acquire animals and construct new exhibits and buildings. In 1956, the zoo made history with the birth of Colo, the world's first captive-born, Western lowland gorilla. During the 1960s and 1970s, the Zoo added major exhibits including a reptile house, the Children's Zoo, and the herbivore/carnivore and pachyderm buildings. 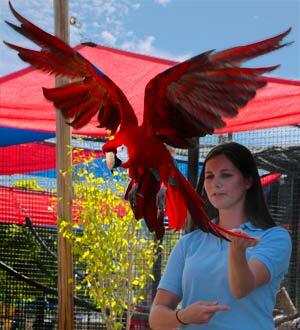 The Zoo received accreditation by the American Association of Zoological Parks and Aquariums (AZA) in 1980. During the same decade, the Zoo gained recognition nationally for housing four generations of a lowland gorilla family, one of the largest collections in the country. 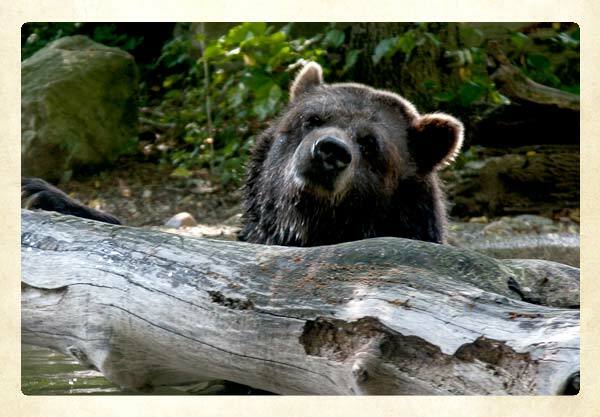 Open 365 days a year, the Zoo is the number one rated cultural attraction in central Ohio receiving more than 1.3 million visitors each year. The success of the Zoo has been based on a blend of private and public support and the enthusiasm of Jack Hanna. There are a number of pavilions and exhibit areas throughout the park dedicated to various species. Another area is called Habitat Hollow that specializes in environmental awareness exhibits. First time visitors should pick up a map of the park at the front gate, and there are also numerous large maps located throughout the park just in case you get lost. If you can't find anything, just ask anyone; everyone working at the zoo will be able to give you good directions. One of the features at the Columbus Zoo & Aquarium is the Grand Carousel. This particular Grand Carousel was manufactured in 1914 by the William I. Mangels Company with wood horses carved by the Marcus Illions Company. This beautifully handcrafted carousel didn't start out at the Columbus Zoo, but was first located at the Olentangy Amusement Park just off North High Street in Clintonville. When the Olentangy Amusement Park closed in 1938 the carousel was relocated to what was then called the Scioto Ranch Park. 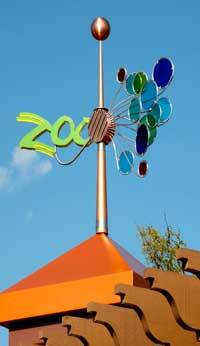 Later it changed names and became the Zoo Amusement Park and Wyandot Lake. 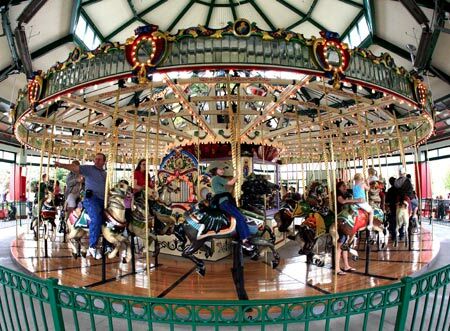 In 2000, the restored carousel with 52 horses and 2 chariots, began operation again inside the confines of the Columbus Zoo. At the beginning of the 20th Century there were almost 5000 Grand Carousels in operation. Today there are fewer than 200 still in operation. Besides the Grand Carousel nestled inside the zoo grounds, on the south side of the zoo in between the zoo and the Zoombezi Bay, are a number of rides that have been restored from the old Wyandotte Park that was once part of the Columbus Zoo. 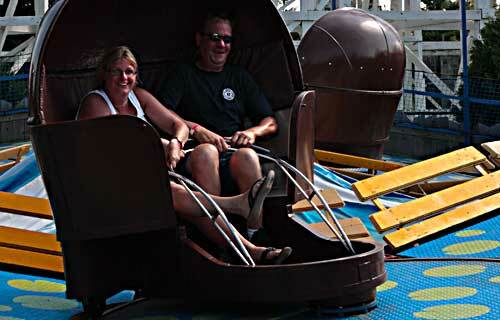 These rides will take older visitors back to when they were young and amusement rides were something that spun you around and around. It is great fun to see them restored and new generations enjoying them. Every year the Columbus Zoo and Aquarium gets turned into a wonderland of lights. It takes about 4 months to string all the lights. The Central Ohio Model Railroad Club also gets into the act by laying over 6000' of wire and 600' of train track for the Wildlights exhibit that runs starting about mid November, through December. Through an ongoing upgrade, the 1000s of Christmas lights are being converted to energy saving LEDs. The first week of January, they begin taking down the lights to get ready for Spring— taking the lights down only takes about 3 months. 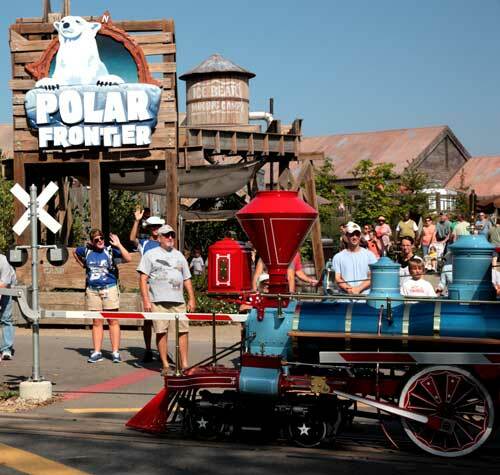 Besides the Model Train Railway, there is also an ice rink (skate rental is available), reindeer, Santa Claus and plenty of photo opts. 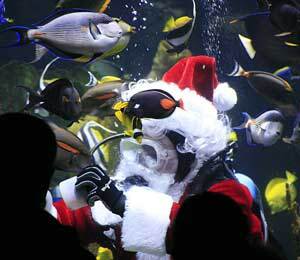 Don't forget to check out Santa feeding the sharks at 7:00 p.m. at Discovery Reef. The new water park opened in May 2008. The new 22.7 acre water park, called Zoombezi Bay, is a name chosen by Central Ohio residents. The water park is part of the park grounds and is located just south of the zoo. Separate admission is required to the water park. Jack Hanna was hired in 1978. 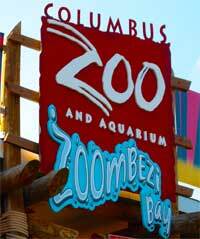 When hired he set as his top priority to increase attendance and build interest in the Columbus Zoo. He started by offering educational and entertaining events. In 1983 he was invited to appear on Good Morning America, and then a few years later he appeared on Letterman's show several times each year. Bodhi was born at the Columbus Zoo & Aquarium in April 2004. He is an Asian Elephant. 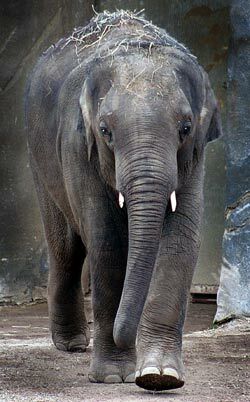 In 2012 Bodhi moved to Denver Zoo's Asian Tropics. The Denver Zoo is located on 10 acres of land, consists of five elephant yards and can house eight to 12 elephants at a time. Bodhi's father was Coco and his mother is Phoebe.